Solitude seekers, be warned! 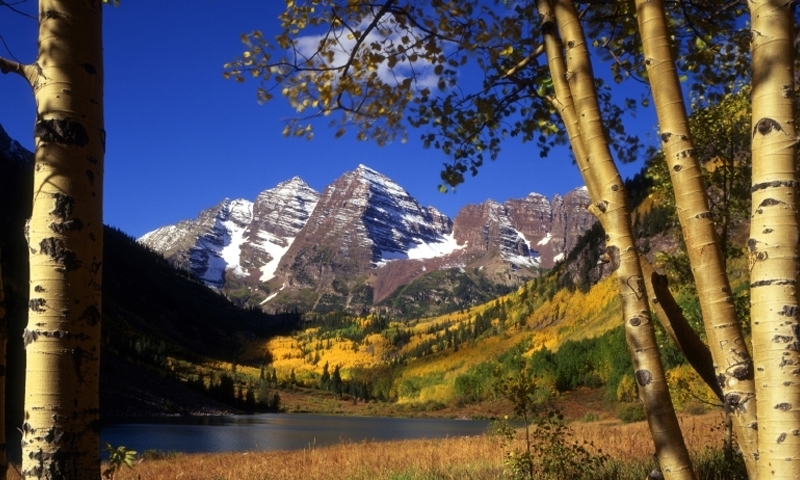 Maroon Bells, a photogenic, two-peaked mountain, beckons tourists with outdoor fun for all skill levels. Subsequently, this highly-trafficked area necessitates restricted accessibility in the summer season. Maroon Bells Scenic Area has limited accessibility by car during the high summer season. Bus services to Maroon Valley are readily available for minimal fees. Hikers must carry permits while using trails. No food vendors on site. Camping allowed only in designated campsites. No motorized crafts allowed on Maroon Lake. The Maroon Bells, a set of peaks which sit just above 14,000 feet, strike a remarkable silhouette in the Colorado sky. Photographers have long immortalized it, and tourists have flocked to this area, just miles from the town of Aspen, CO, for years. The preserved wilderness area hosts mountain adventures that range from technical climbing routes for skilled mountaineers to hikes for the novice sight-seer. These famous peaks are located in the Elk Mountains in White River National Forest. 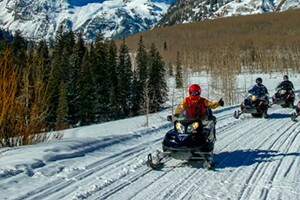 8am - 4:30pm, daily: Maroon Bells Bus provides access to recreation in Maroon Valley; tickets and pick-up for RFTA buses at Aspen Highlands Ski Resort. $8 for adults. $6 for kids and seniors. Free parking. Buses drop-off and pick-up frequently (20 min. intervals). As detailed above, the summer season marks the high point for traffic in Maroon Valley. The winter months, with bountiful snow (and fewer visitors), can make Maroon Bells a landscape of opportunity for skiers and snowshoers. The access road, however, is subject to closures due to snow conditions. A phone call to Aspen Ranger District Headquarters at (970) 925-3445 can provide important information regarding travel conditions. Maroon Valley's 100 miles of trails makes this area so desirable. Permits (free) are required of trail hikers and are available at trailheads. West Maroon Trail: For hikers looking for a greater challenge, follow the trail to Crater Lake, then continue on along West Maroon Trail, which climbs fairly steeply, crossing streams, and eventually, heads to steep switchbacks and a strenuous traverse to the summit of Independence Pass. This hike measures about 6.5 miles (one way). Many hikers choose to continue further on this route to Crested Butte. North Maroon Peak (14,014') and South Maroon Peak (14,154'): Both peaks are accessible from Maroon Bells parking area, by way of Buckskin Pass Trail. Bagging these summits demands technical equipment and skills, as well as endurance and good judgment. At the base of the Bells, Maroon Lake offers an ample harvest for anglers. Call Division of Wildlife at (303) 297-1192 for licensing and other information. Boaters may be dismayed to find that no motorized activities are allowed on the lake. While camping is not permitted at Maroon Lake, there are three campgrounds convenient to the the recreation area. Silver Bar Campground: Located on Maroon Creek Road, sites are available by reservation. Restrictions include a five-night, two-day limit, with eight people maximum per site. Dogs are allowed on leash only. Amenities include picnic tables, trash disposal and vault toilets. Campsites at Silver Bell and Silver Queen campgrounds are available at $15 per night. To make your reservations, call 1-877-444-6777.